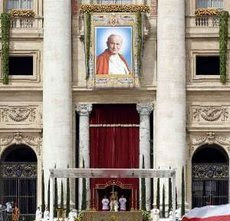 One of the biggest highlights of my recent trip to Rome was attending the beatification of my hero, Pope John Paul II. What made the celebration extra amazing was that I acquired a special pass that got me all the way up to the colonnade roof overlooking St. Peter’s square. The view was absolutely incredible. jdesto: Wow! I wish I would have had time to scale the dome. That must have been an incredible view! In 1949 we were required to check our camera–an ancient 35mm–in the loggia, so no pictures record our elevator (yes!) ride to the roof and, incredibly, walking up a stairway attached to the dome and to a door that opened. Inside we found ourselves standing on a VERY narrow iron ledge with a single safety rail. The view above the main altar from inside the dome was awesome, but we were so scared that we stayed only a few seconds and returned to the roof. An amazing adventure. Yeah I tried to tell him that IMABLOGGERRRRRR but he just whipped out his sword and started swinging. Didn't that Swiss guard know that you love the Pope–I mean, c'mon–he needs to read the blogs!